The Miami Hurricanes men’s basketball team is in the Sweet 16. The third-seeded ‘Canes advanced with a 65-57 win against the 11th-seeded Wichita St. Shockers Saturday in Providence, R.I. in the second round of the NCAA Tournament. 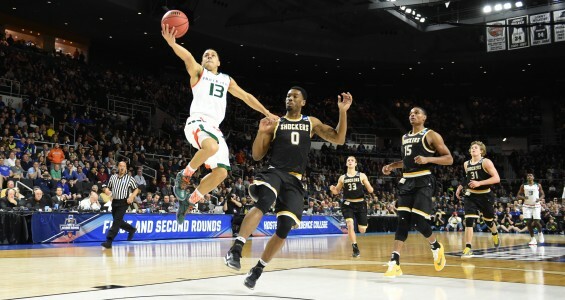 Senior guard Angel Rodriguez took over the game early and late for Miami en route to scoring a career-high 28 points. Rodriguez started 7-7 shooting while adding two steals in the early going, helping the ‘Canes build a 21 point lead a little over halfway through the first half. Apparently, he felt this kind of game coming, telling his teammates a calm came over him before the game, according to Miami coach Jim Larrañaga. It was a two-man show for Miami, just as it was against Buffalo in round one. Sheldon McClellan was the other man, scoring 18 points on 5-11 shooting, including two three’s. Miami’s ticket to the Sweet 16 appeared to be punched before the second half even began. In the NCAA Tournament, however, no lead is safe, and the Wichita St. defense entered the game allowing 59.3 points per game, the fewest in the country. The ‘Canes offense slowed down to bridge the first and second halves, as the game turned to a slugfest. Wichita St. cut Miami’s lead to 13 with the help of a 11-0 run. The Shockers kept the pressure on in the second as well, but the ‘Canes came prepared to exchange blows. Forward Kamari Murphy continued to be a defensive presence as he recorded two blocks and two steals for Miami. Murphy also had a game-high seven rebounds. Rodriguez picked up a steal early in the second half when he swiped the ball away from a driving Shocker. When the ball ricocheted, he hit the deck to keep a Shocker from getting his hands on it, and managed to find an open teammate in the process. Wichita St. came all the way back to hold their first lead of the afternoon, 43-42, 10 minutes in to the second half. The comeback was fueled by 20 second chance points stemming from a 16-2 offensive rebound difference in favor of Wichita St. Even with the disparity, the lead lasted all of 57 seconds before the ‘Canes took it back for good on a fastbreak dunk by McClellan. Fending off another Shockers run, Miami finally began to pull away. Guard Davon Reed swatted a Shocker from behind on a Wichita St. fastbreak opportunity and got the ball for Miami. Seconds later, Reed struck from behind the arc, his second three of the game, to put Miami up seven with just under five minutes left. Reed finished with 10 points. An Angel got the scoring started for Miami. That same Angel wielded the dagger that ended the Shockers season. With the ‘Canes up two, Rodriguez hit a wild layup high off the backboard late in the shot clock to put Miami up four, 57-53. The game’s MVP came back to knock down a triple on the next possession to seal the win. Rodriguez scored the final 10 points for Miami. It is Miami’s second Sweet 16 appearance since the 2013 season. Miami was the ACC regular season and tournament champion that year. Miami plays the second-seeded Villanova Wildcats (31-5) Thursday at the KFC Yum! Center in Louisville, Ky. The game start time is TBD.